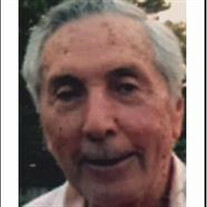 Yilmaz Cetin Belentepe, 85, passed away peacefully from acute myeloid leukemia in the Cleveland Clinic on August 23, 2017. Yilmaz was born in Antalya, Turkey to Yildirim and Seher Akyuz Belentepe. He was: a beloved father of Nilgun B. Trogdon (spouse Raymond D.) of Charlotte, North Carolina and Cengiz Y. Belentepe (spouse Tomoko T.) of London, England; dear grandfather of Raymond E. Trogdon, Henry O. Trogdon, Kapri M. Belentepe and Cyrus T. Belentepe. ; dear brother of Yavuz Belentepe of Istanbul, Turkey (deceased). Yilmaz was formerly married to Kadriye T. Belentepe of Boca Raton, Florida. He was also a dear friend of Marilyn Isler of Shaker Heights, Ohio. He was an avid scholar, trained initially at Technical Teachers College in Ankara, Turkey, and then sponsored by the United Nations to do research on Thermodynamics & Dynamics of Supersonic Flow at Technical University of Copenhagen, Denmark. Later he was a Rotary Scholar and attended the University of Wisconsin, Madison Wisconsin for his M.S. in Mechanical Engineering. Professionally, Yilmaz Belentepe was an inventor, researcher, and educator, having held positions at Corning Glass Works and General Electric Corporation. He held numerous patents and published many papers. His specialties were in heat transfer, stress analysis, fluid flow and computer modeling. After retirement, his passion shifted from science to dance. He traveled the United States immersed into tango workshops. He then choreographed, taught, competed and advocated for dance as a healthy way of life. He even brought the character James Bond to the Cleveland world of dance. Mr. Bond stood for a sense of grace, poise, sensual appeal, and yet, gentlemaness that tango embodies. In addition, he was a compassionate person - always helping others. Even in the last stages of his life, in the face of cancer, he brought joy and hope to the patients, staff, nurses and doctors. He danced with them, doing his favorite tango figure with a backward kick, saying "Get out of here Leukemia!!" He became known as the Tango Star at the Levine Cancer Institute in Charlotte, NC, where he showed courage, kindness and a sense of grace in the face of this disease and brought happiness to others and himself. He will be remembered as a passionate and kind individual. The family prefers that those who wish may make contributions in his name to Dancing classrooms of Northeast Ohio, 1085 Rockside Rd., Suite 6, Parma, OH 44134 (www.DCNEO.org) or Levine Cancer Institute, Hematology Research Fund, c/o Carolinas Healthcare Foundation, 208 East Blvd., charlotte, North Carolina 28203 (givecarolinas.org). Public Graveside Services will be held at Lake View Cemetery, 12316 Euclid Ave., Cleveland, OH 44106 on Saturday, September 2 at 11 AM.